» What Does OKC Need to Change on Offense? The Oklahoma City Thunder only lost to the San Antonio Spurs by three points in Game 1, but the score doesn’t tell the whole story. The Spurs dominated the fourth quarter, scoring 39 points and wrapping up the game before the final minute. Oklahoma City had their chances, and this is far from a mismatched series, but if they are going to win they need to make adjustments on offense. 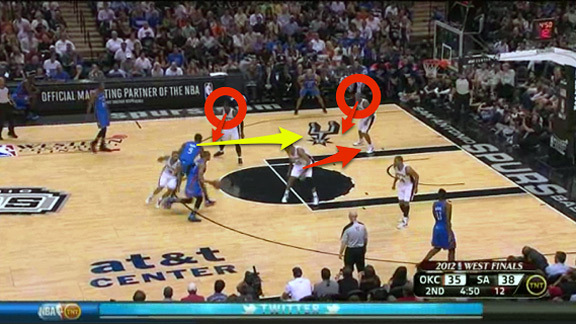 The pick-and-roll is key for for the Thunder, which I wrote about before the series began. The Spurs struggled to defend the pick-and-roll all season long, and in the postseason, they’ve also had problems with the high pick-and-roll. Fortunately for the Thunder, they thrive with the latter. So why didn’t they exploit this in Game 1? (They scored just 36 points on 45 pick-and-rolls.) They need to use Serge Ibaka as the screener more often. He might be their most dynamic big in pick-and-rolls, but he only played 21 minutes and was barely used in those plays. Here is a chart of the number of screens set by Thunder players, points scored off of those screens, and the points per possession (PPP). 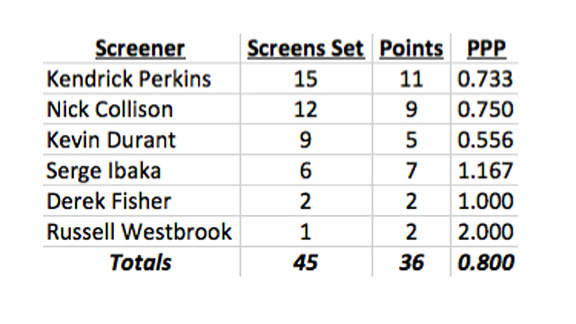 Other then Derek Fisher and Russell Westbrook, who were used as a screeners in special situations, the Thunder posted the highest PPP in pick-and-roll situations with Ibaka as the screener, scoring seven points on the six screens that he set. The Thunder relied on the the pick-and-pop with Westbrook and either Harden or Durant, likely because Ibaka has been struggling to make his shots. And though this play is effective, it should be used sparingly, preferably at the end of games. The Spurs quickly developed a strategy to defend it. Instead, the Thunder should go back to pick-and-rolls with Ibaka because he remains a threat to score, which forces the defense to guard him closely and creates space for the Thunder ball handlers. 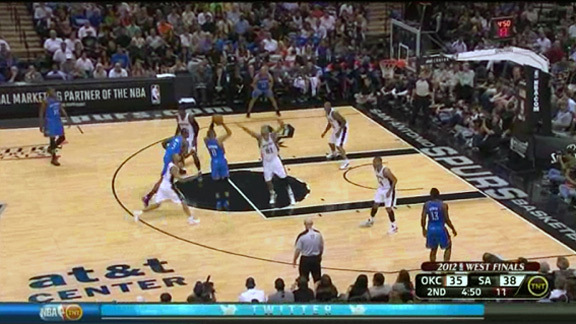 On this particular play, Westbrook sets a screen for Durant, flares out, and then gets the basketball from him. As Westbrook makes the catch, Ibaka steps up and sets a ball screen. Westbrook squares up and then uses the screen. When Westbrook comes off the screen, Ibaka rolls straight to the rim, forcing the defense to react. 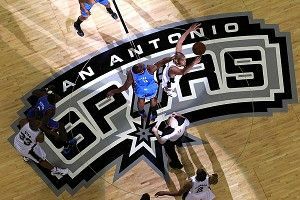 Even though Westbrook is a very good shooter, Tim Duncan’s first step is backward, away from the ball, and Steven Jackson and Boris Diaw are prepared to tag the cutter, which is Ibaka. The defense is very tentative as Westbrook comes off of the screen, and they don’t attack him because they are worried about Ibaka. Watch Gary Neal. Since Ibaka is a threat to roll to the rim, he leaves his man, James Harden, to rotate over and help on Ibaka. If Durant doesn’t make it to the rim, Harden is there for a wide-open 3-point shot. 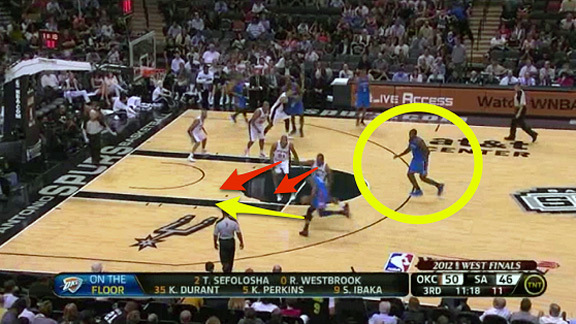 The Thunder rarely got these open looks when Kendrick Perkins or Nick Collison acted as the screener. Because neither is really a threat on the offensive end, the defense was able to overload the ball handler. On this particular play, Durant comes off of a Perkins screen. 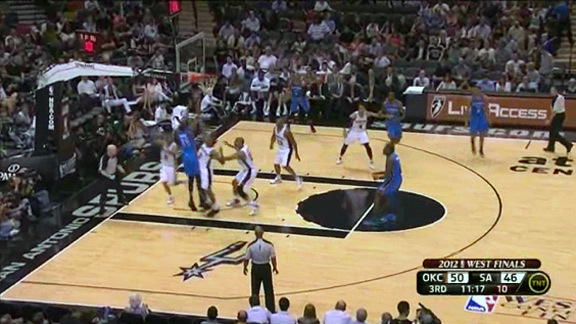 This time, Duncan attacks Durant, essentially double-teaming him, while Perkins is wide open at the free throw line. Because Perkins is not a scoring threat there, the Spurs can defend the pick-and-roll with five guys covering just four Thunder players. There are not multiple scoring options as there were when Ibaka was setting the screens. 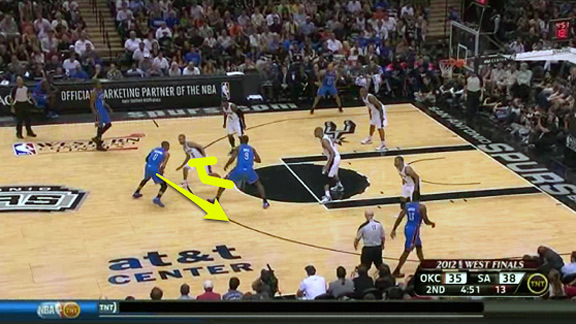 In the first clip, look at how the defense uses the extra defender (the man covering Collison) to crowd the paint. Harden, typically deft driving in the paint, is forced to make the kick-out, and the Thunder settle for a contested 3-point shot. In the second clip, Collison’s man is able to leave him and dedicate himself to keeping Harden out of the paint, resulting in a charge on Harden as he tries to create something out of nothing. The most telling stat from the Thunder’s pick-and-roll play? Of the 45 ball screens tracked by Synergy Sports, only four of them resulted in the screener getting the pass, mainly because Collison and Perkins aren’t threats and aren’t viable options. The reason why pick-and-rolls are so hard to defend is that there are a number of options the defense needs to worry about. But when it becomes a one-option play like we saw with Collison and Perkins as screeners, it’s easy to defend. Choosing to leave Ibaka is not necessarily the most obvious move. Perkins stayed in as a way to prevent Duncan from scoring in the post, but Ibaka deserves more minutes. He’s what makes the Thunder’s pick-and-roll so dynamic.